A policeman patrolling the streets of Brackenbury Village in the late 1900s took down some notes while wandering along Cardross Street. He noted that the residents were ‘poor labourers’, while at the upper windows of the houses were children with dirty faces. Meanwhile, he observed, women ‘who do laundry work’ busied themselves for long hours in the area. His observations tally with the census returns of 1891 and 1901 that confirm there were large numbers of women living in Cardross Street taking in laundry in order to earn some money to help feed the family. With regard to the ‘children with dirty faces’, the census returns for 1881 reveal there were 293 children under the age of 14 living in Cardross, a staggering 43% of the total population of the street. By 1901 that figure had risen to 312, or 44% of the population living in this relatively short road in Hammersmith. More than half the cottages at this time were occupied by two or more households, which would account for the large numbers of children. And the majority of these households were sharing the sparse water facilities, which explains all the little ‘dirty faces. These fascinating historic facts are all part of the research carried by Moya Tyson, a late resident of Cardross Street, who had hoped to publish a book on the life and times of the street where she lived. Among the many interesting facts she uncovered were the accounts of the jolly street parties held by the residents. A royal jubilee or a coronation was always a good excuse for the tables to come out and the bunting to be hung across the street. Sometimes there would be competitions between the adjoining streets in Brackenbury to decide which had the best decorations. The mayor of Hammersmith or some other local worthy would usually be called up on to judge the contest. When cameras became cheap enough to be widely available, black and white photographs captured the excitement of the day. 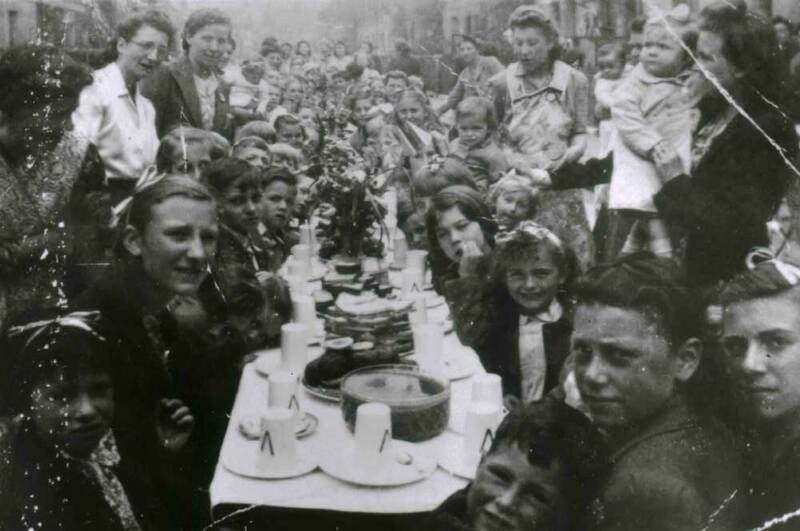 The now-faded images show cottages decorated with Union flags and children seated on benches in front of tables groaning under the weight of cakes and sandwiches, while their mothers, in their best aprons, stand proudly behind. Many thanks to Local History Sponsor Daniel Doherty at Daniel Paul Estate Agents.